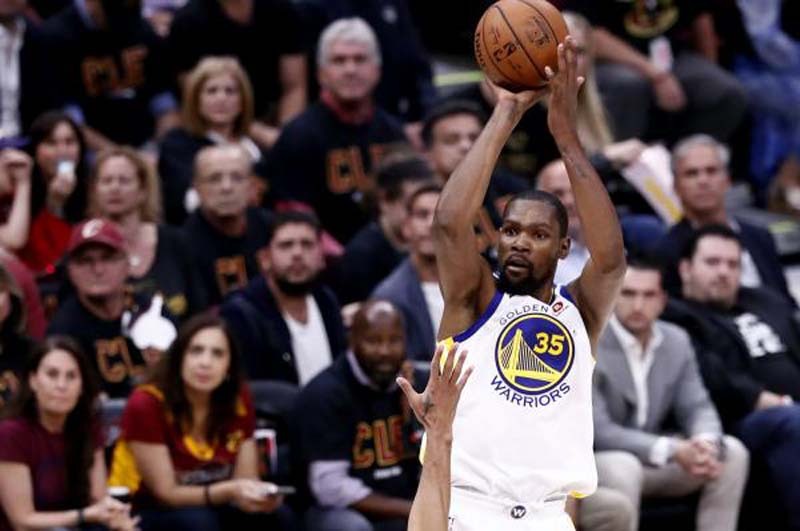 The Cavaliers played the Warriors tight through three quarters before Durant helped the Golden State go up 3-0 in the series with a big fourth frame performance Wednesday at Quicken Loans Arena in Cleveland. Stephen Curry was the Warriors' second-leading scorer, netting 11 points. LeBron James had 33 points, 11 assists and 10 rebounds in the loss. "We aren't done playing basketball yet, so I don't really look at these as defining moments, "Durant told reporters. "I don't want to downplay anything, but I don't want to act like this is the end of the road. So just get back to work tomorrow and figure out a better game plan." "I thought we did some things tonight that we need to correct if we want to win next game. I'm really just trying to come in and trying to be the best player and teammate I can be until this thing is over. I just gotta to stay locked in." The Cavaliers claimed a 29-28 first quarter advantage. James was a facilitator early on, chipping in six points, five assists and two rebounds in the first frame. Kevin Love and J.R. Smith each scored seven points in the opening quarter. Durant had 13 points and seven rebounds to start the game. Cleveland used a 10-0 run to build a 16-4 lead before Durant helped close the gap. In the second quarter, Cleveland broke out to a 6-0 run and took a 35-28 advantage. Love helped the Cavaliers push the lead to 13 points with four minutes remaining in the first half, but Durant once again willed his team back. Cleveland led Golden State 58-52 after two quarters, with Durant netting a game-high 24 points. The Warriors took a 83-81 lead after three quarters, outscoring the Cavaliers 31-23 in the third frame. Kevin Love gave the Cavaliers a 97-96 lead with a pari of free throws with 3:11 remaining, before the Warriors jumped ahead on a Curry layup. Golden State did not surrender that lead. James hit a 3-pointer to put the Cavaliers within one point of the Warriors with 1:57 to go, but Andre Iguodala pushed the lead to three points with a dunk. Durant then hit a dagger 3-pointer with 49 seconds remaining to seal the victory. "It's definitely a tough loss," James said. "We had our chances. We have another opportunity on Friday to win on our home floor. We have been pretty good [there] in the postseason. That's a good thing for us. We have an opportunity to extend the series. But we have to come out and play 48 minutes." Game 4 of the 2018 NBA Finals tips off at 9 p.m. Friday in Cleveland.